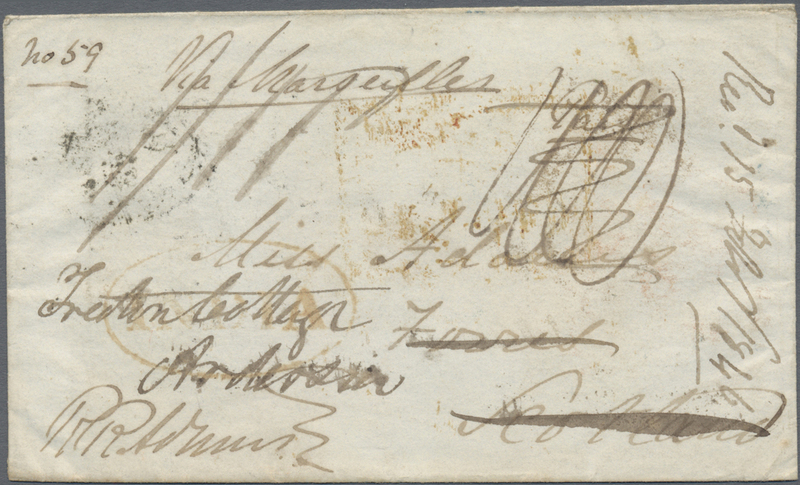 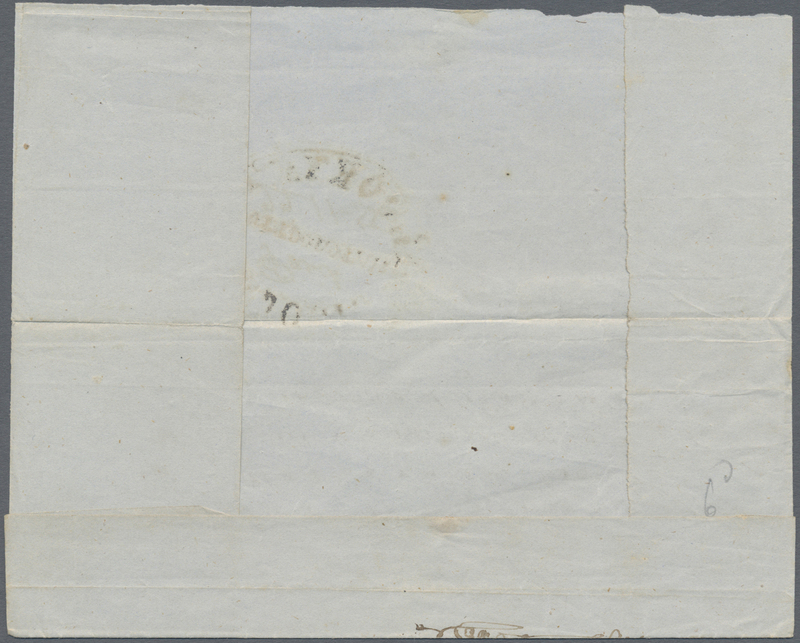 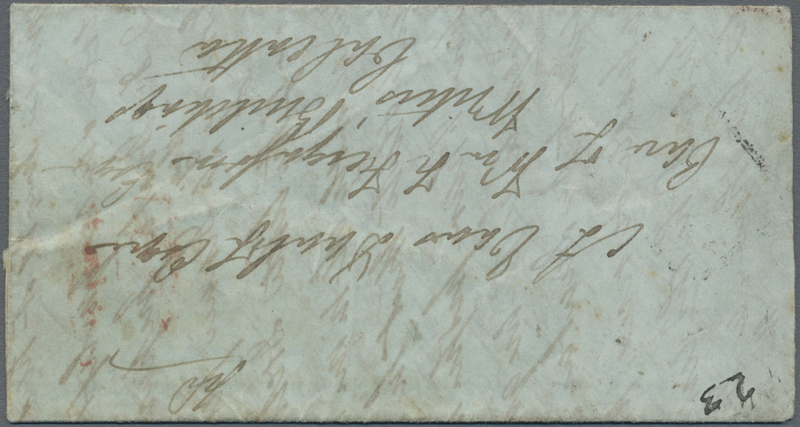 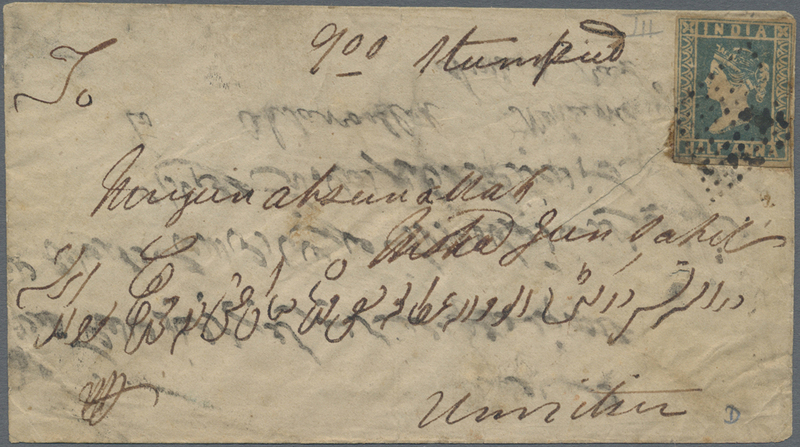 7824 Brief (cover) 1825 BHAUGULPORE: Entire letter sent by 'Lt. 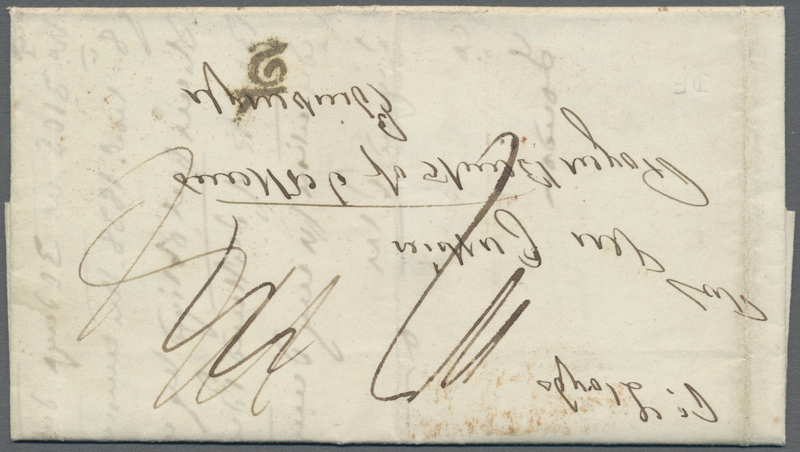 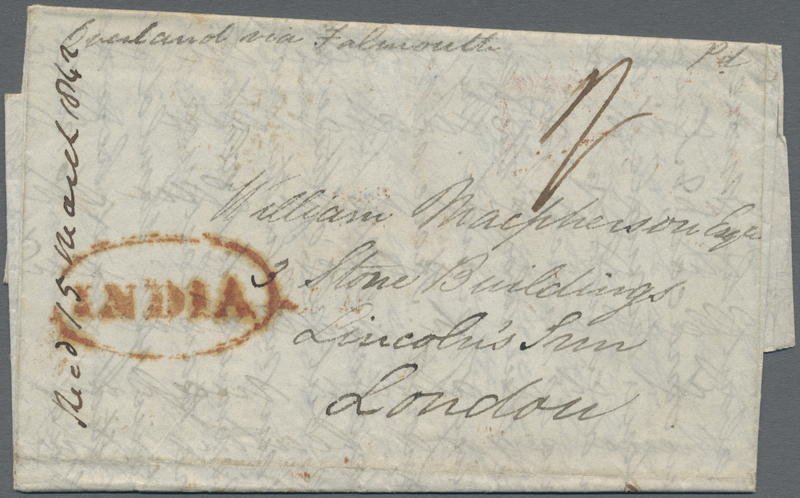 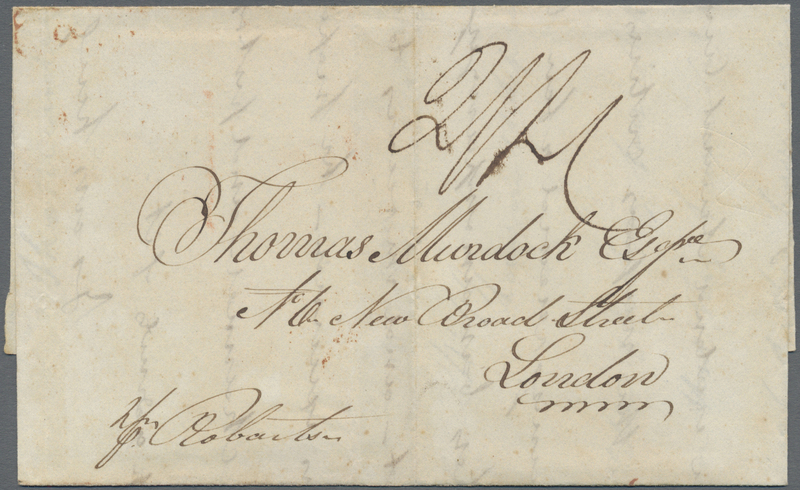 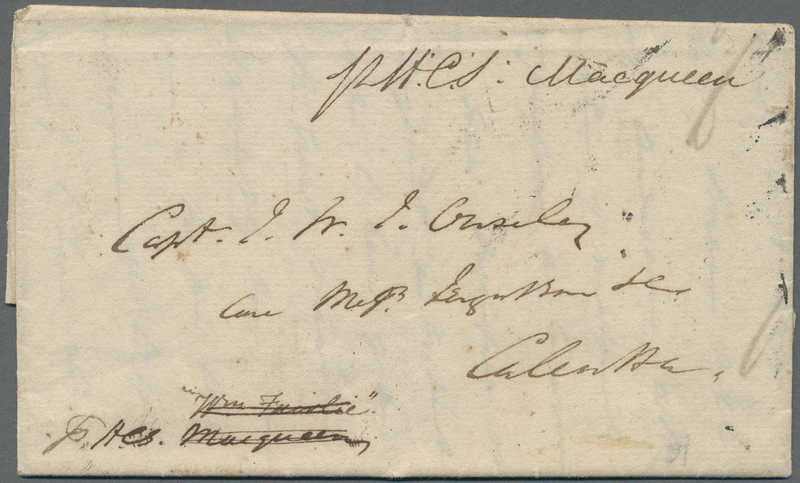 George Fraser at Bhaugulpore' to London via Calcutta and Portsmouth, re-directed to Inverness, dated 'June 13th 1825', cancelled on back by large double oval handstamp "BHAUGULPORE POST OFFICE" (Giles No.4) with m/s 'P.P. 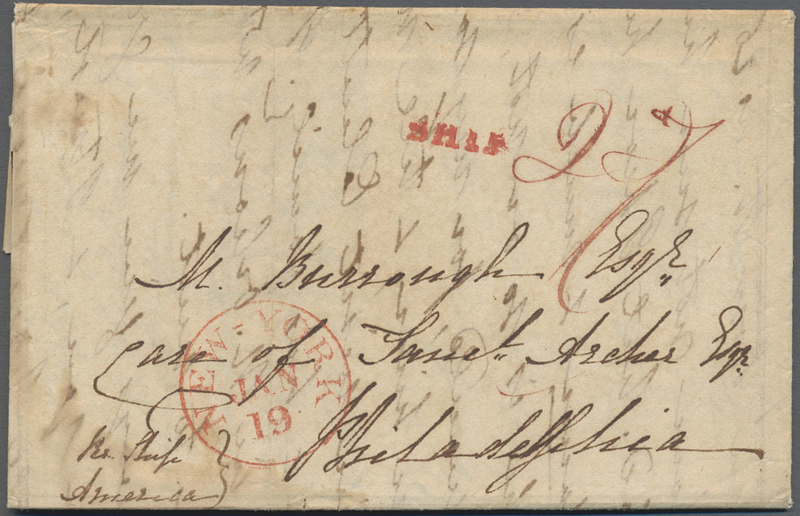 6 as/ship do. 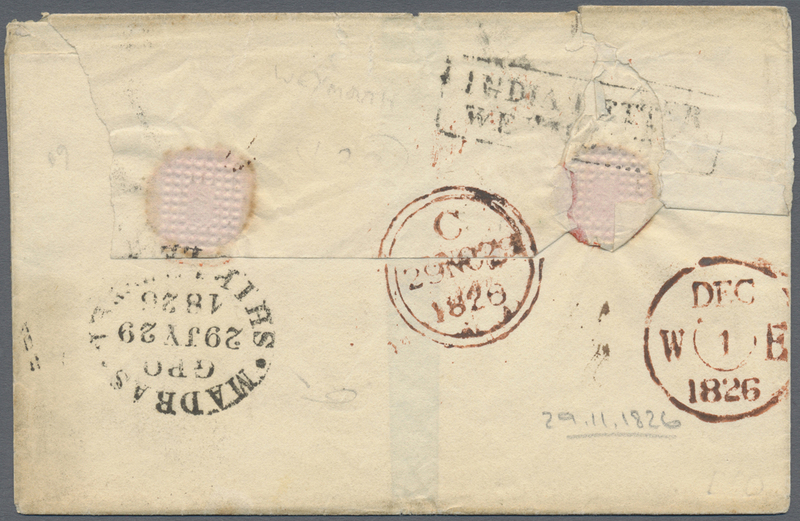 2 as/21 June/1825' in center, also with black "CALCUTTA GENERAL POST OFFICE/(June)/18(25)/26" double-ring d/s and add. 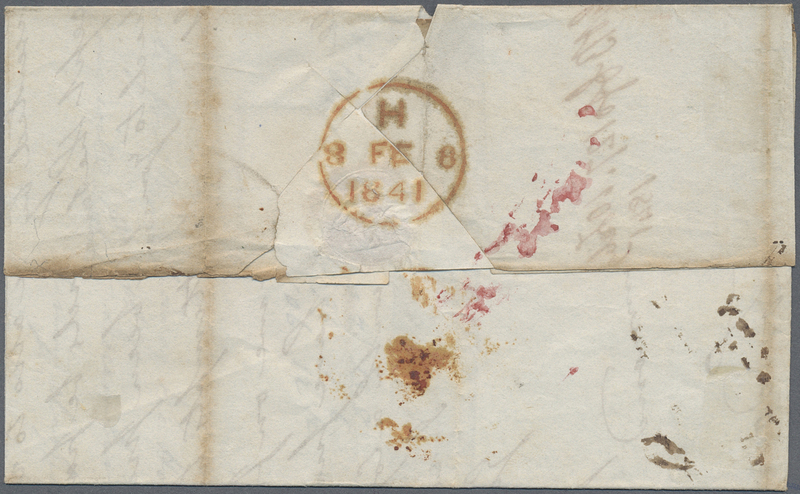 in m/s and two Great Britain 'Jan 1826' arrival/transit datestamps plus "1/2" Scottish turnpike h/s alongside, and on the face with black boxed "INDIA LETTER/PORTSMOUTH" and red "Feb 4, 1826" arrival cds. 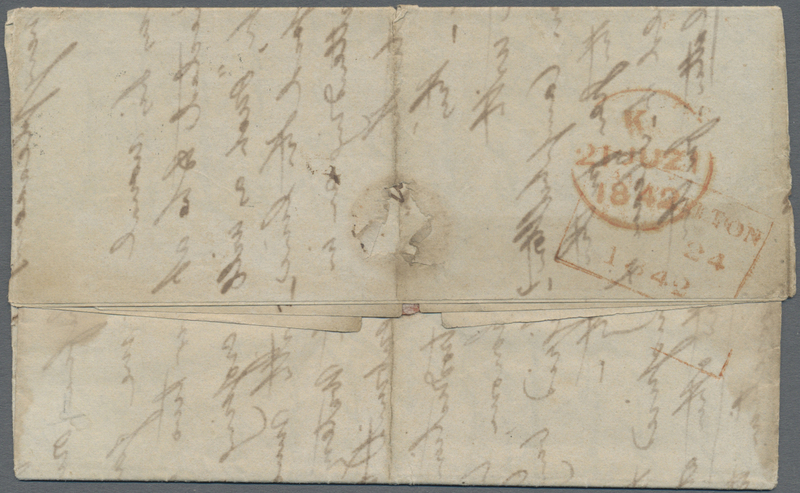 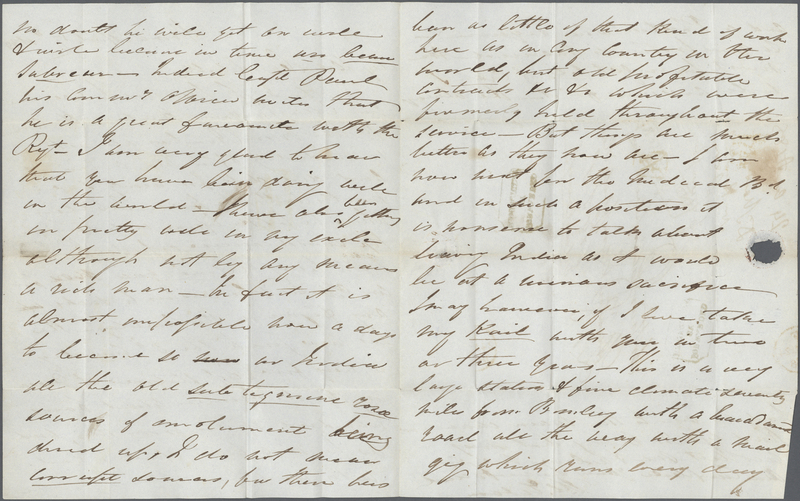 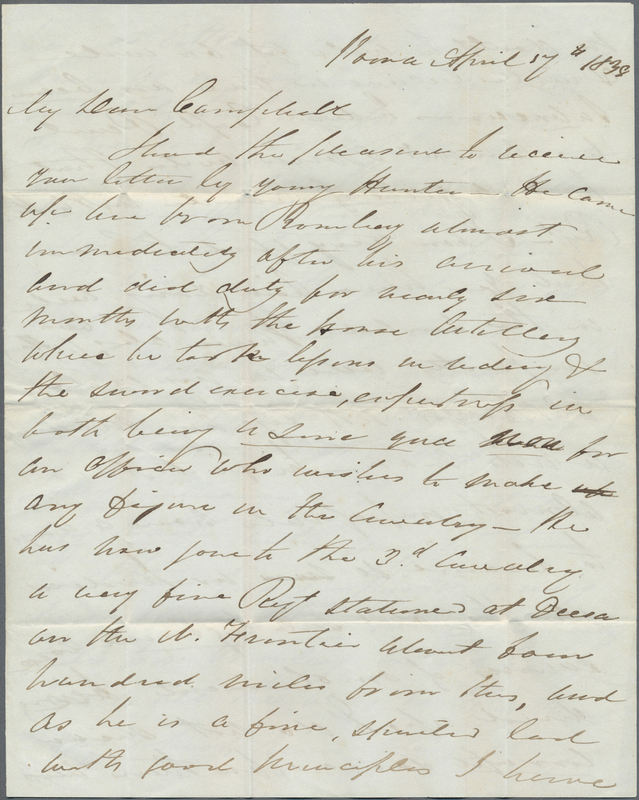 A fresh, fine and unusual letter mention of the 1st Anglo-Burmese War (1824-1826). 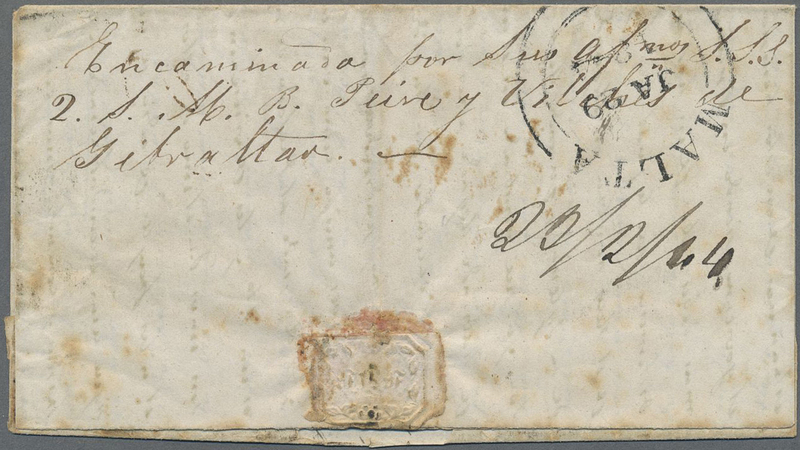 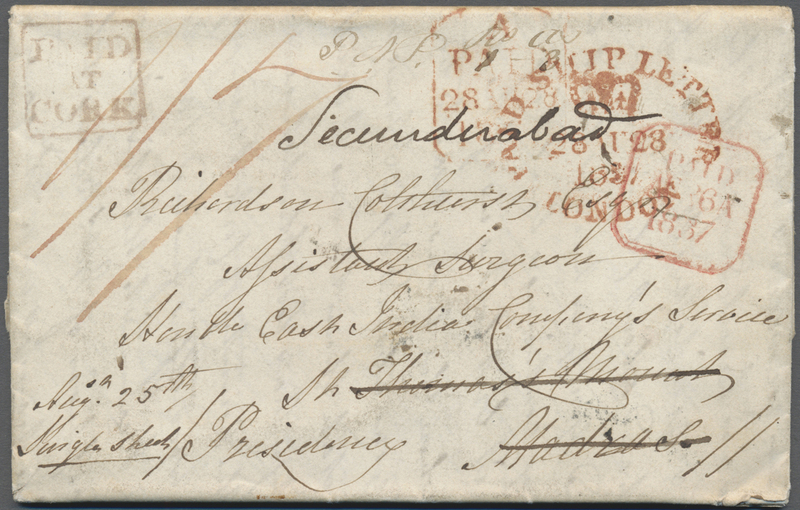 7826A Brief (cover) 1827: "BENARES/POST PAID/ /18 " double-ring datestamp (Giles 3) on back of entire from Sultanpore (17 June 1827) to Chominghee, Calcutta, with red "PM" and large circled "CALCUTTA/G.P.O./25 JU 25/1827" cds in red (Giles G9) alongside, charged "8 as." 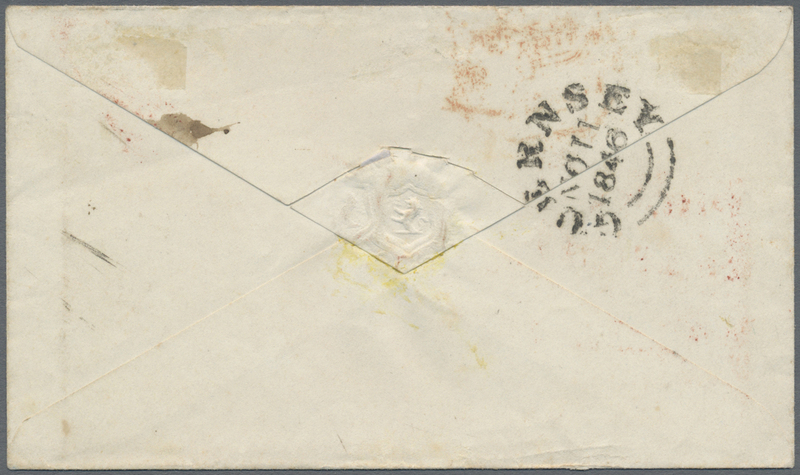 on front. 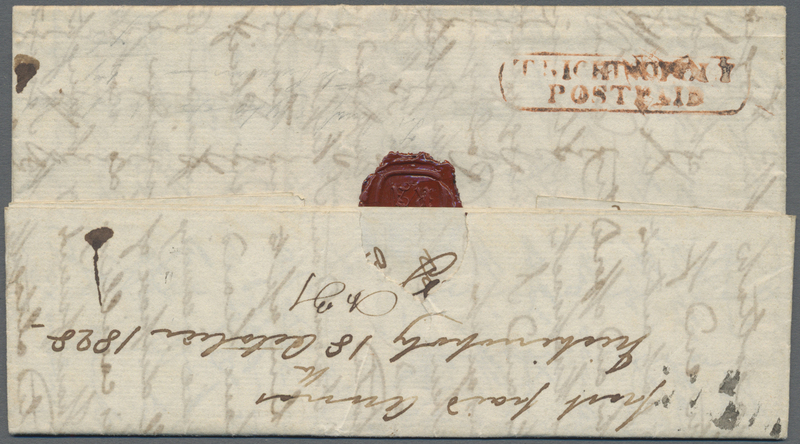 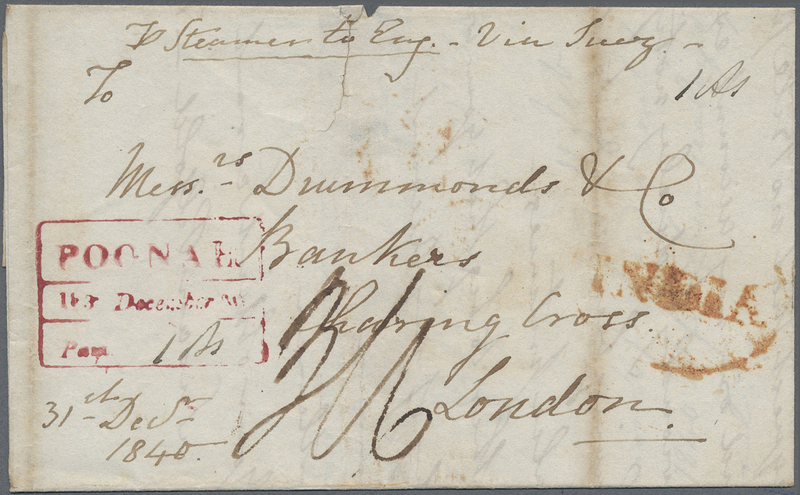 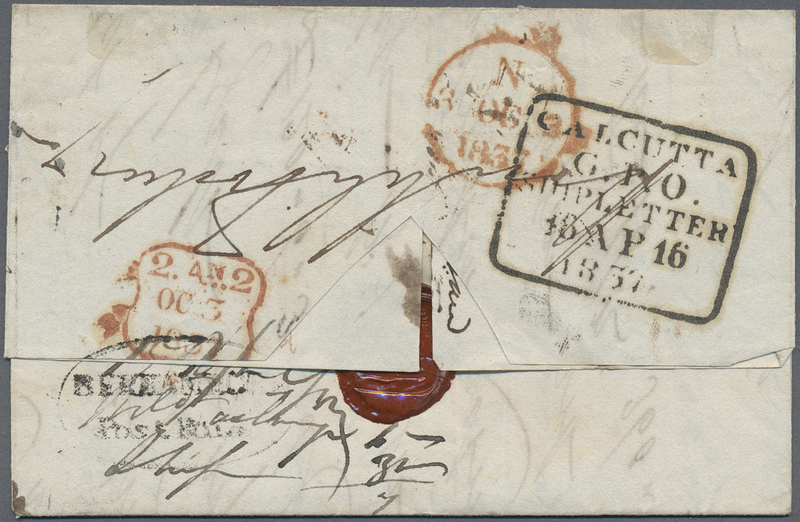 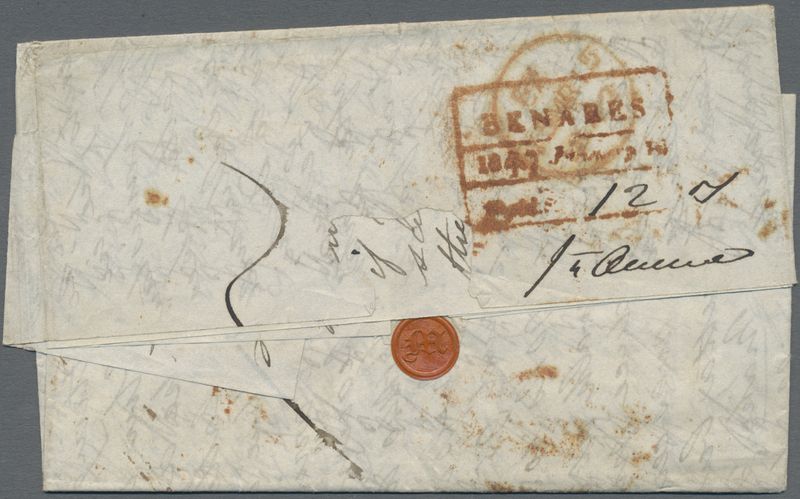 7826B Brief (cover) 1827: Three covers from Calcutta to Europe, carried by different ships, with two covers sent to Nantes, France and one letter to London, redirected, all with "CALCUTTA GENERAL POST OFFICE/..." doubly circled datestamps (Giles SD8b) and resp. 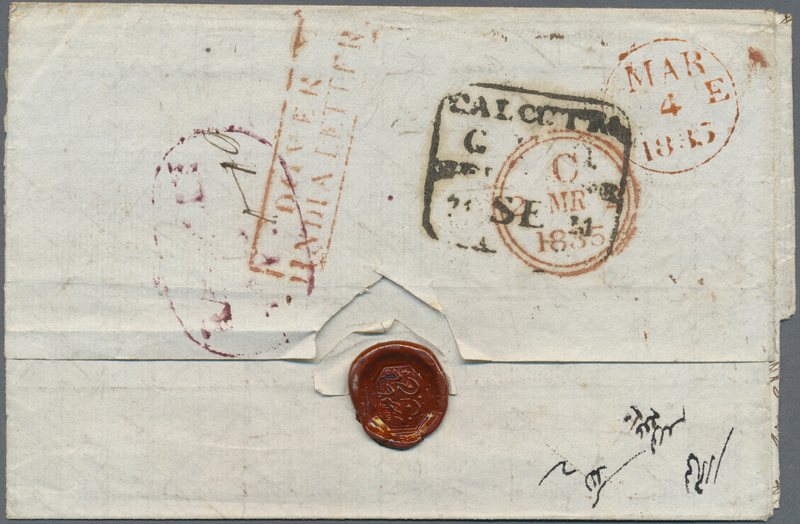 charge marks and arrival datestamps, one cover to France bearing boxed "PAYS D'OUTREMER/PAR BORDEAUX" h/s, the cover to England with boxed "INDIA LETTER/DEAL", fine. 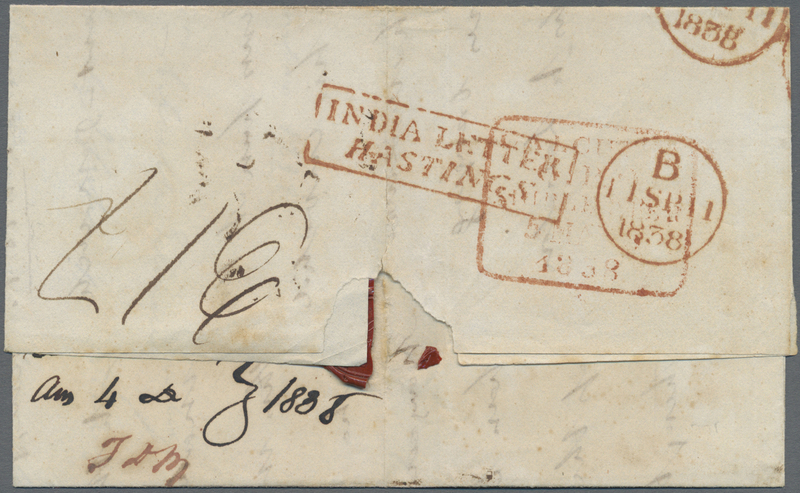 7827 Brief (cover) 1827/1830, Two entire letters from London to Calcutta, with the first one dated August 7th, 1827 bearing red framed "CALCUTTA/G.P.O./30 JA 30/1828" d/s and boxed "Inl.d Ptg -5/Ship Do.-2/(1) As 7"receiving handstamp on back, and a 1830 (Jan 6) letter per "H.C.S: Macqueen" (Honourable Company Shp), with large red "CALCUTTA/G.P.O./11 MY 11/1830" cds and boxed "Inl.d Ptg.-2/Ship Do.-2/(1) As 4" receiving h/s on the reverse. 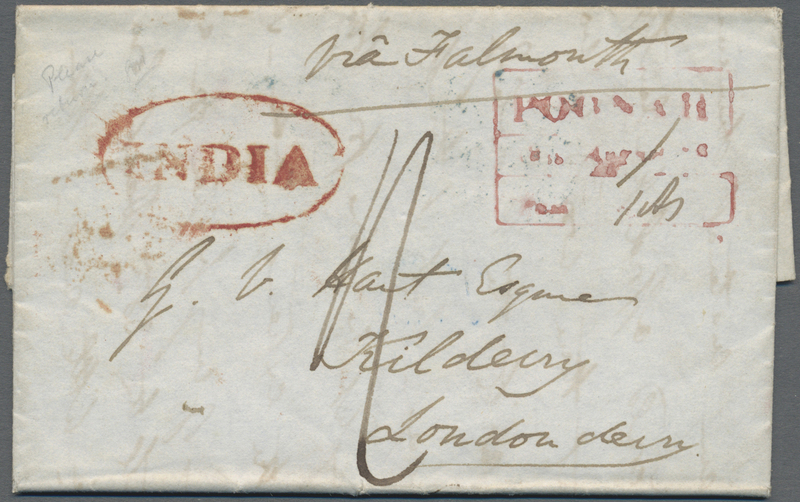 7828A Brief (cover) 1828/1841: Two letters from the Clarke correspondence sent from England to Calcutta in 1928/1929, with respective Calcutta ship letter receipt datestamps, and two letters from the Huth correspondence from Madras to London in 1941. 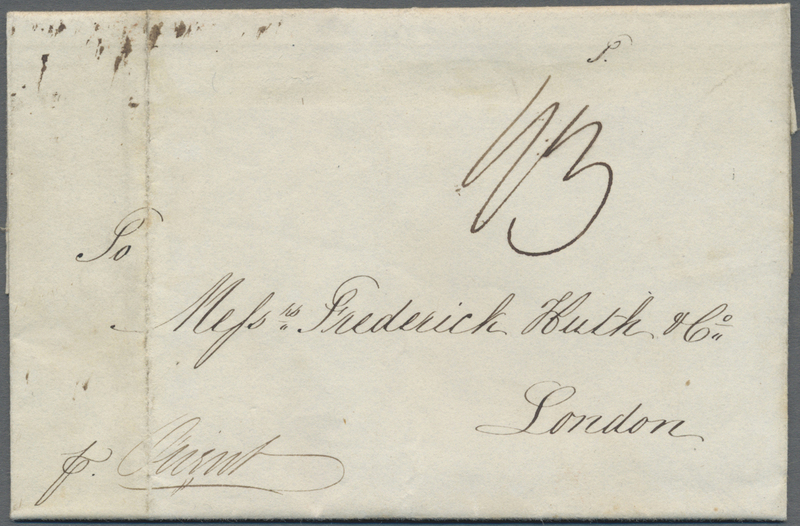 7831A Brief (cover) 1833: Oval handstamp "MERUT/ /Pt. 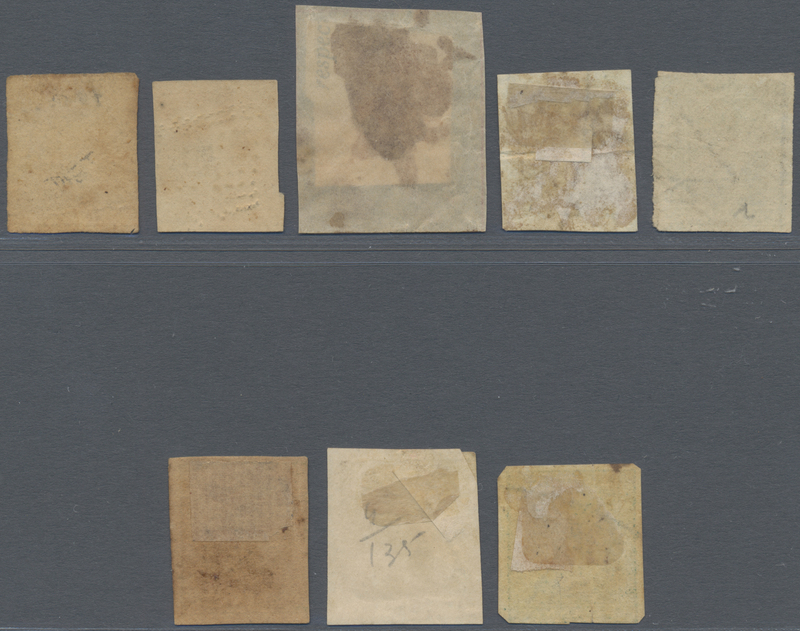 Pd." 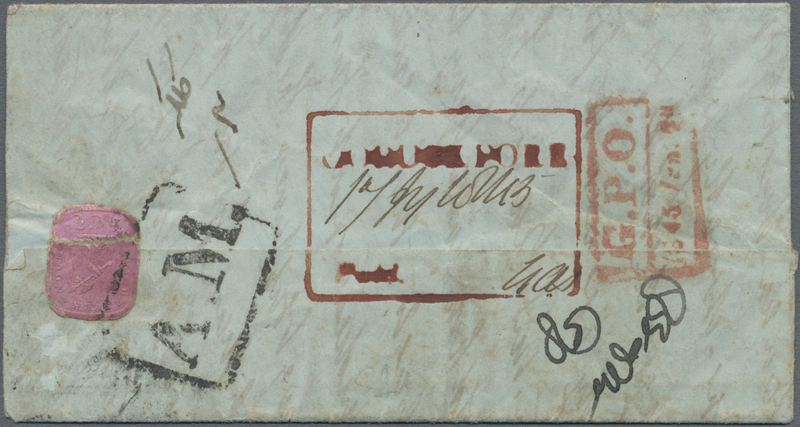 in black (Giles 3, 2nd setting) with "1 Dec.r 33" date in m/s, on back of entire addressed to 'Captain J. Cartwright, Artillery, Dum Dum'. 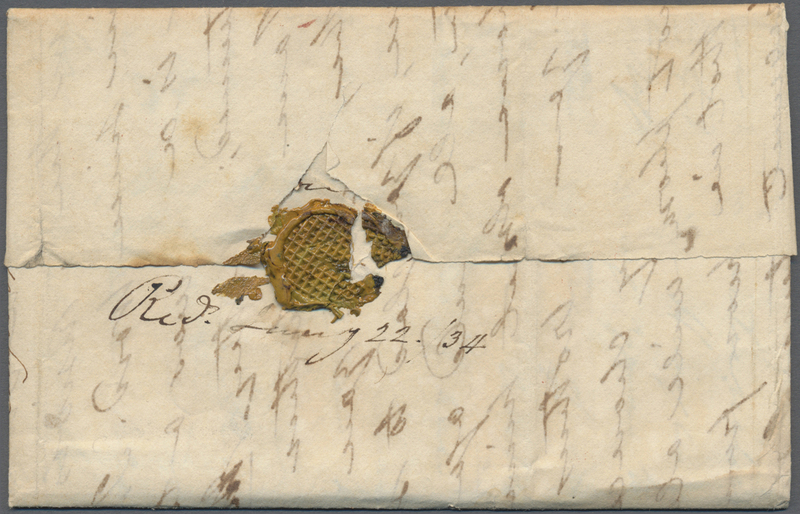 The letter partially fragile, fine. 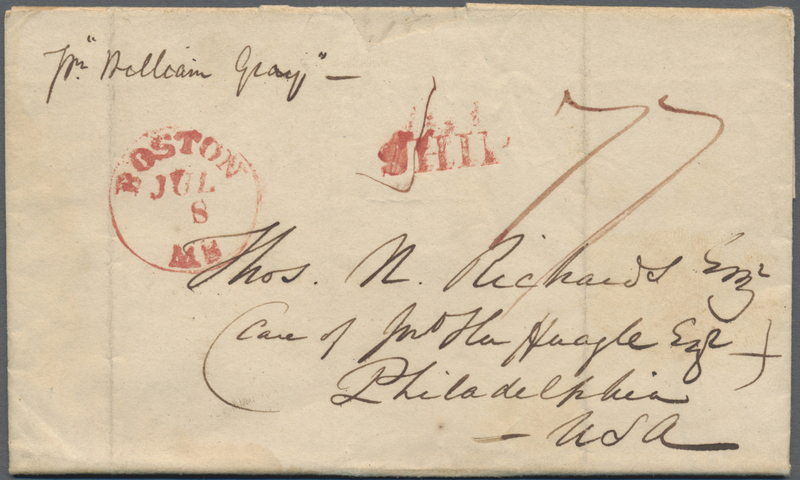 A fine strike of this scarce and early handstamp. 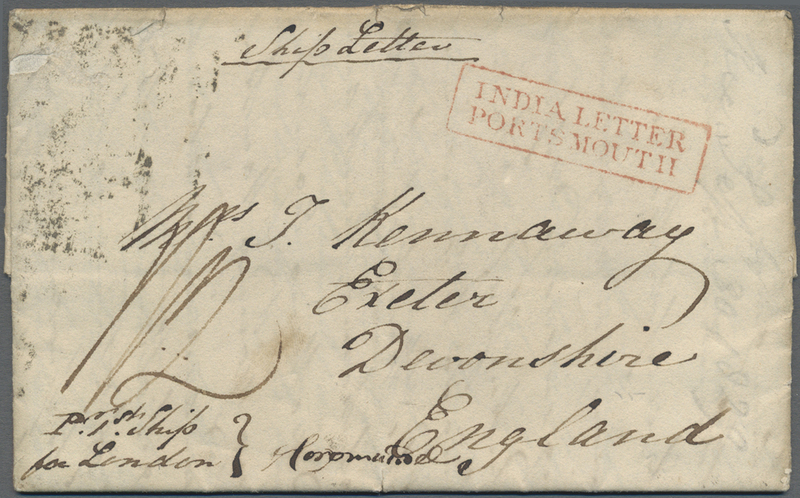 7832 Brief (cover) 1834 Entire letter from Midnapore to Edinburgh via Calcutta and Dover by the "Lord Lynedock" bearing large circled "MIDNAPORE/pt.pd.//18" h/s with '6 annas/11 September 1834" in m/s, boxed "DOVER/INDIA LETTER" in red, transit and arrival datestamps on back, boxed "1/2" Scottish add. 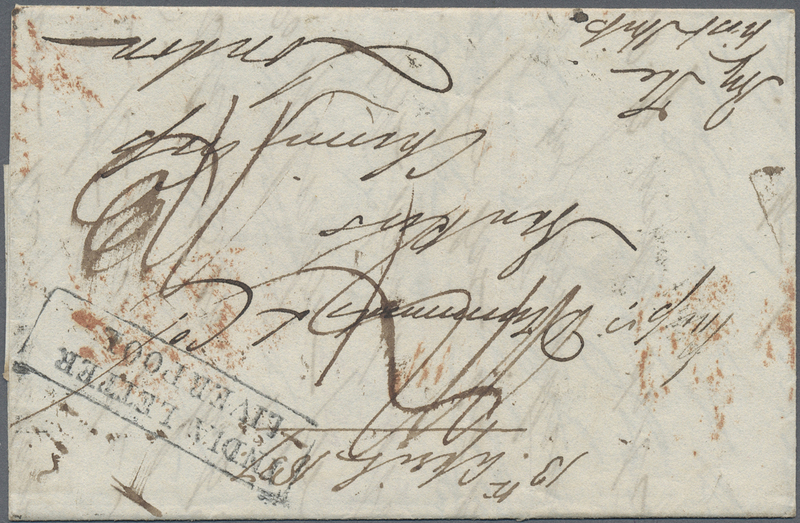 postage h/s and charge marks on face, accompanied by complete typewritten duplicate of the letter related to the Himalaya region. 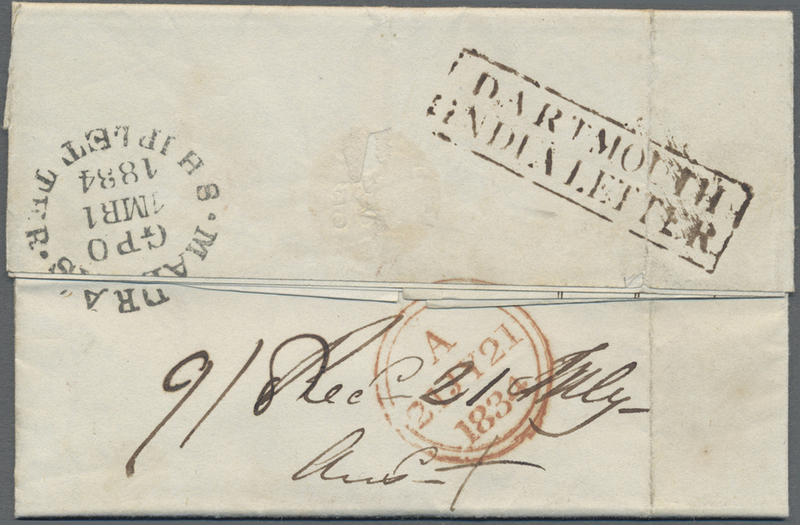 7834 Brief (cover) 1835: "BARELLY/Pt.Pd." 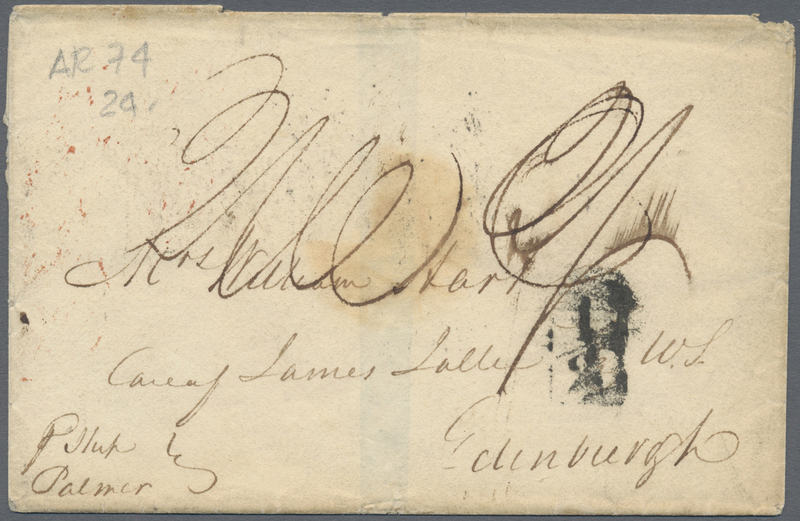 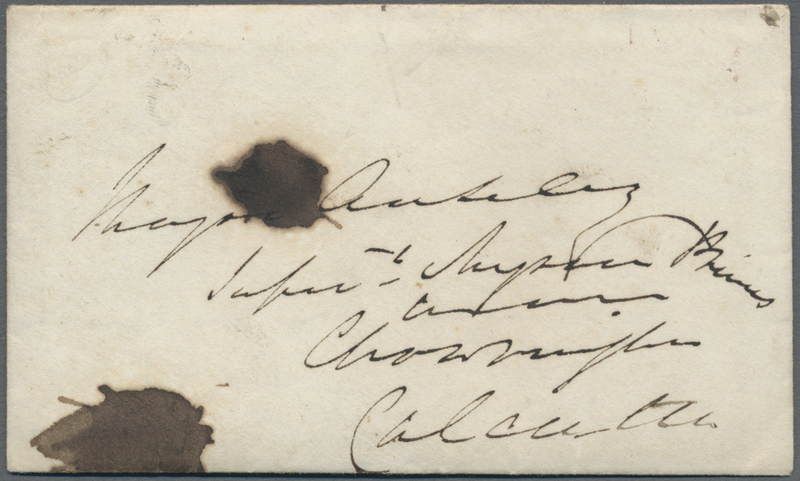 oval handstamp in purple on back of letter to Inverness, Scotland via Calcutta and Dover, with Calcutta G.P.O. 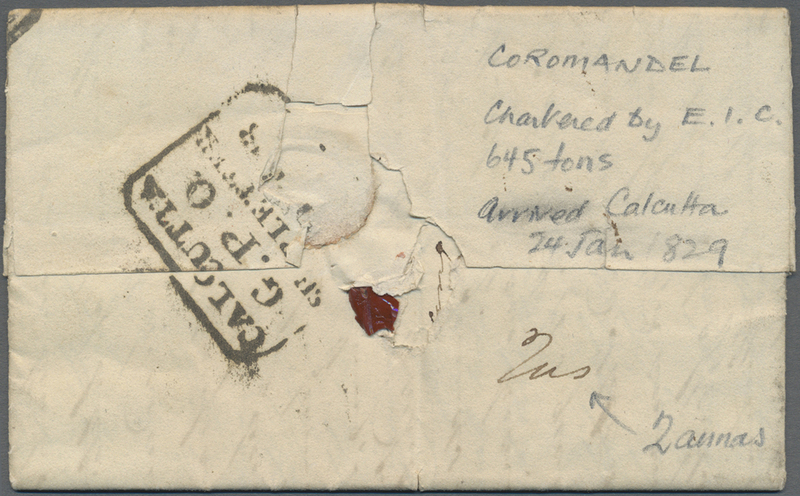 '21 Sep 35' transit datestamp in black, red boxed "DOVER/INDIA LETTER" and UK datestamps in red on back, boxed "1/2" (Scotish rate) h/s on front, fine. 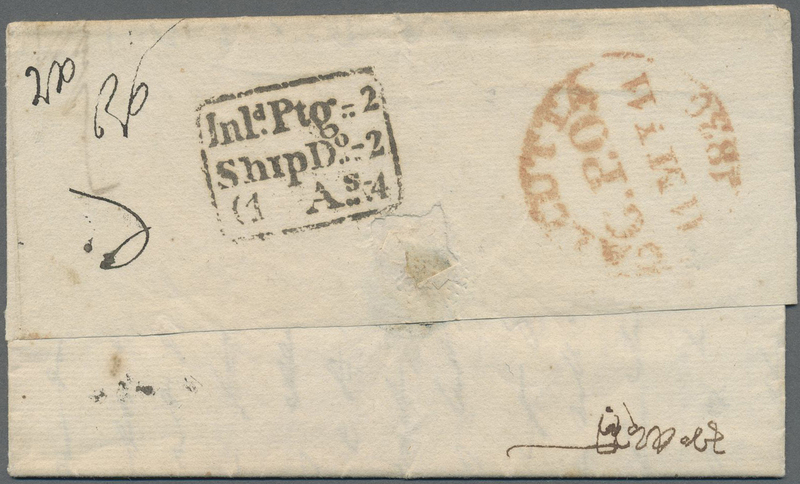 7835A Brief (cover) 1836: Large circled "GHAZEEPORE/pt pd / /18 " handstamp (Giles 5) with charge "8" and date "22 March 36" in m/s on back of entire from R. De L'Etang, Ghazeepore addressed to W. Laing, Agra and with full contents incl. 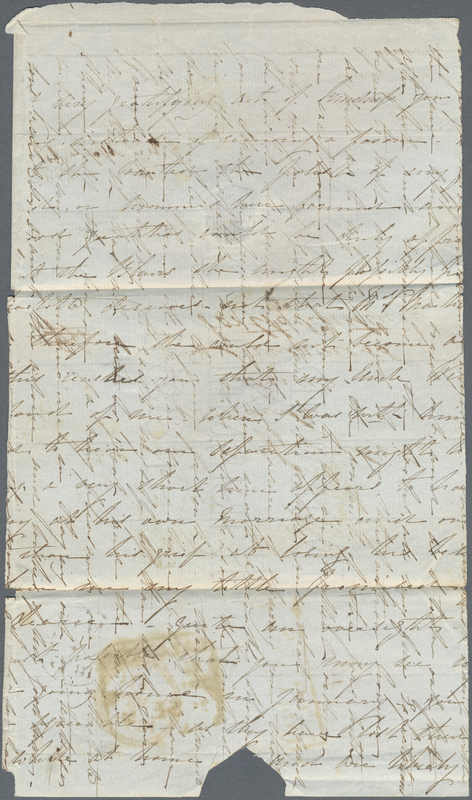 a receipt (type-written copy attached). 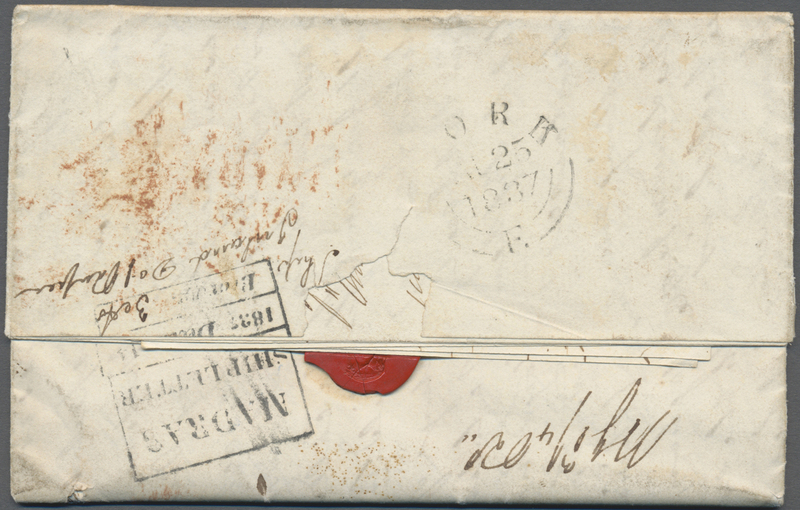 The letter with some tape stripes in order to stabilize edges. 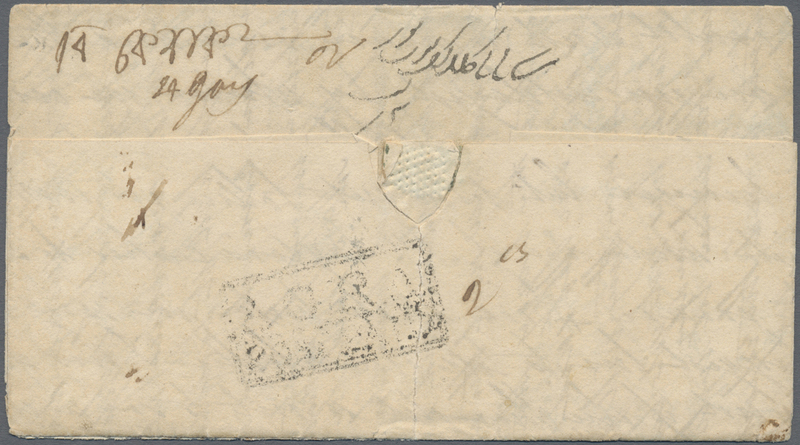 7838 Brief (cover) 1838 Entire letter from Dadoopur to Edinburgh, Scotland via Kurnal, Calcutta and Dover, with trisected "KARNAUL/1839.../Paid." 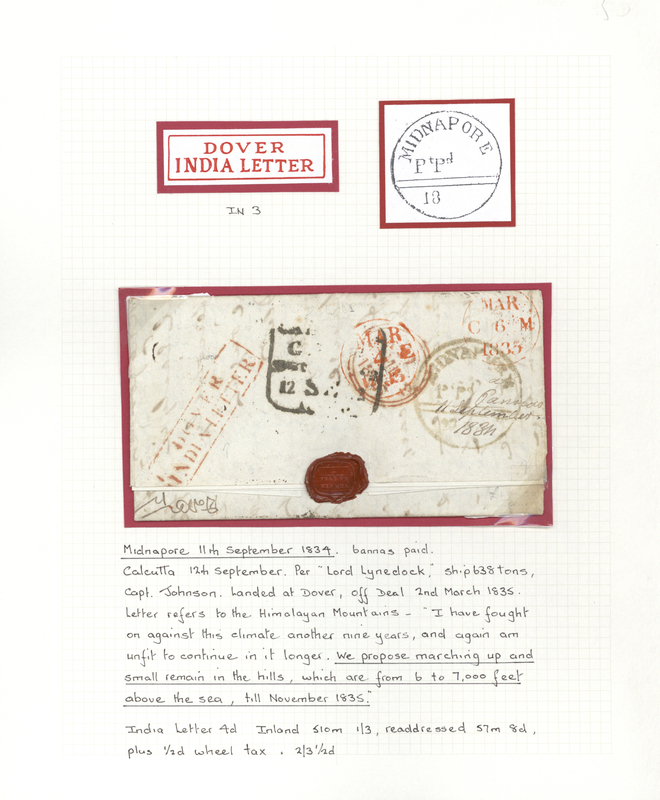 d/s, respective transit datestamps, boxed "DOVER/INDIA LETTER" and '12 Jan 39' arrival cds, and with manuscript map inside, fine and interesting. 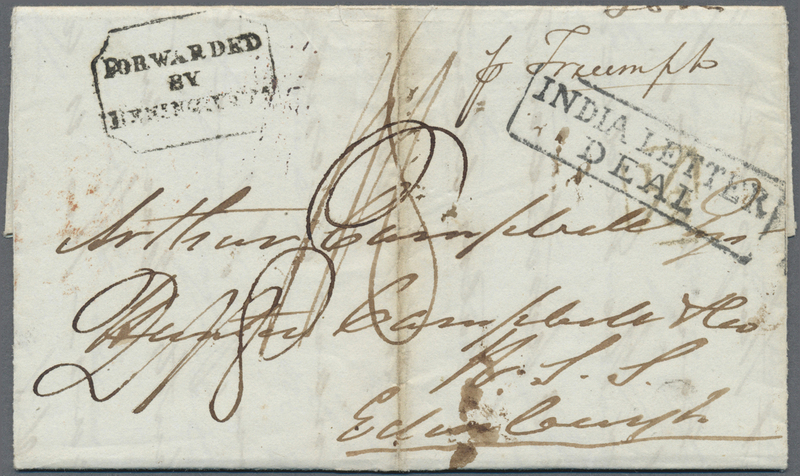 7839 Brief (cover) 1838 Forwarded letter from Poona (17 April 1838) to Edinburgh, Scotland "FORWARDED/BY/REMINGTON Co." (octagonal framed h/s) at Bombay, with boxed "INDIA LETTER/DEAL" h/s and several charge marks (incl. 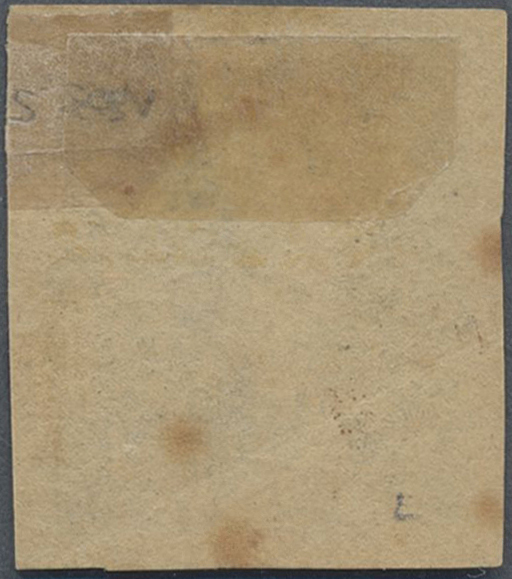 '2s8d.') 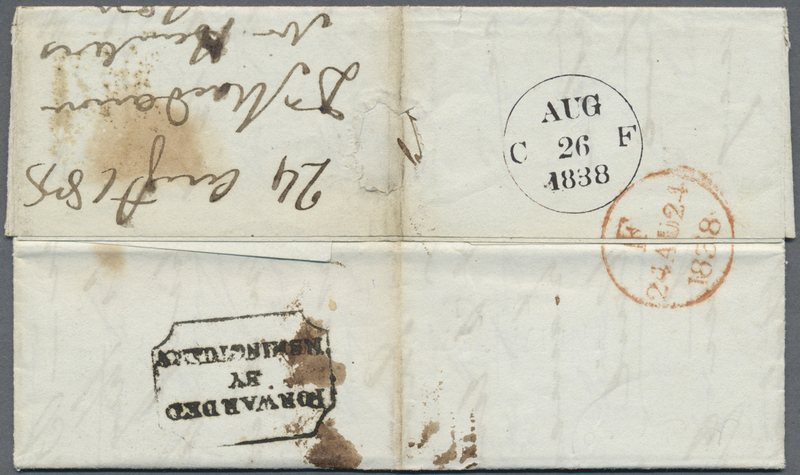 on front, '24 Aug.' England arrival cds in red and '26 Aug.' arrival cds in black on the reverse. 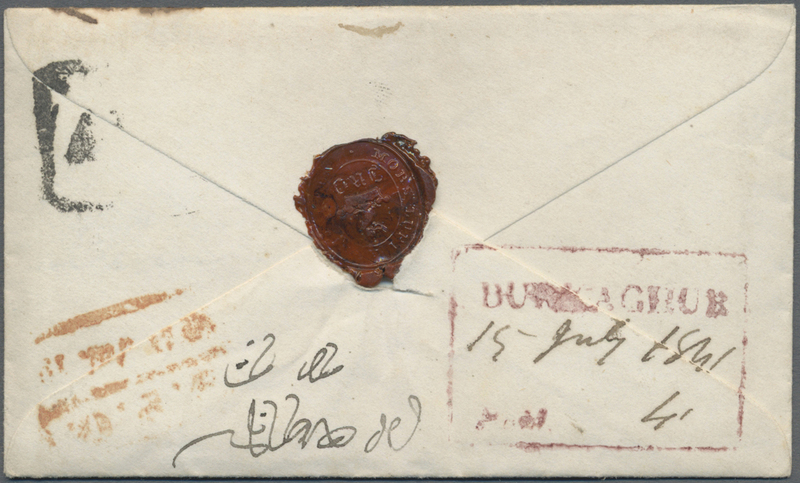 Letter with a central vert. 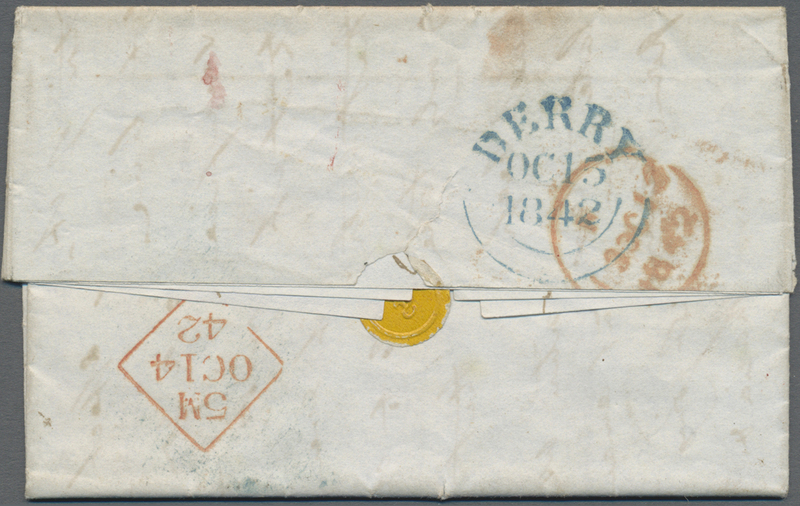 fold otherwise fine. 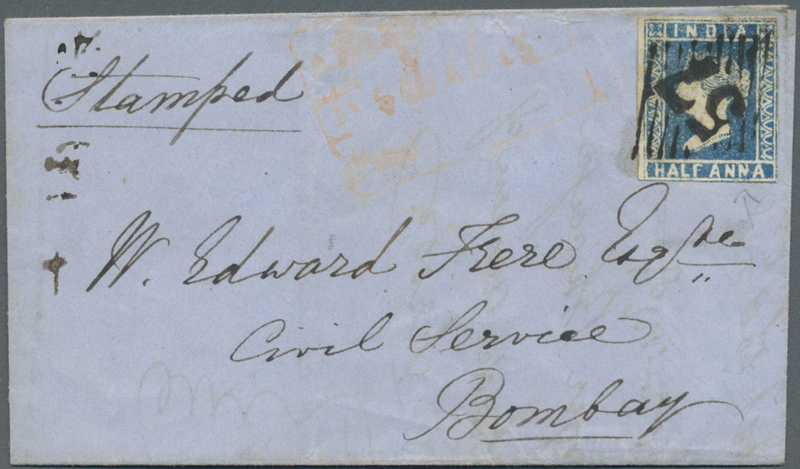 One of the earliest known letters forwarded by Remington & Co., Bombay. 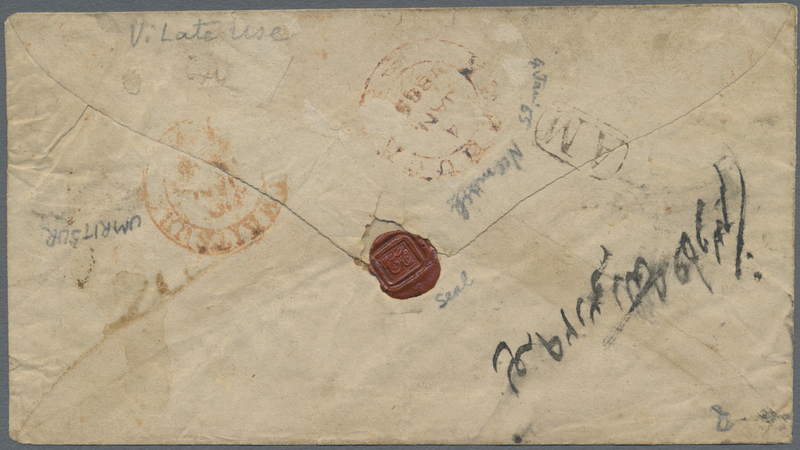 7848 Brief (cover) 1844 Letter from ?? 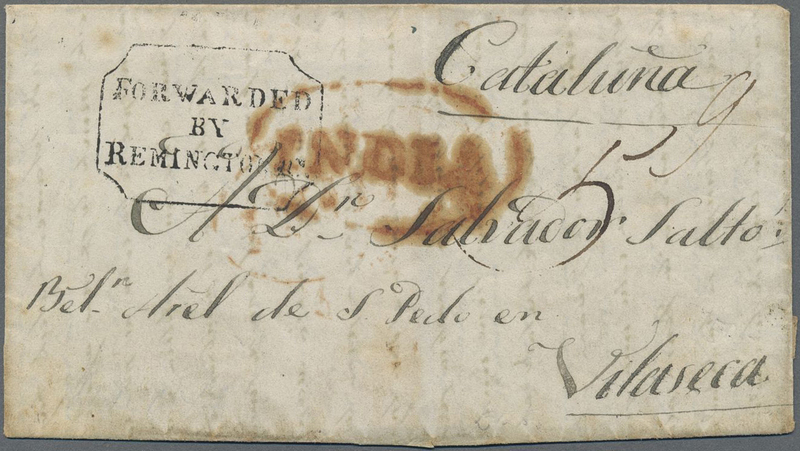 ?, forwarded by Remington & Co., Bombay (framed handstamp) and addressed to Vilaseca, Cataluña, Spain, sent via Malta and forwarded again by Peire y Vilches, Gibraltar (note on back), with red INDIA in oval on front, "MALTA/JA 29/1844" cds on the reverse. 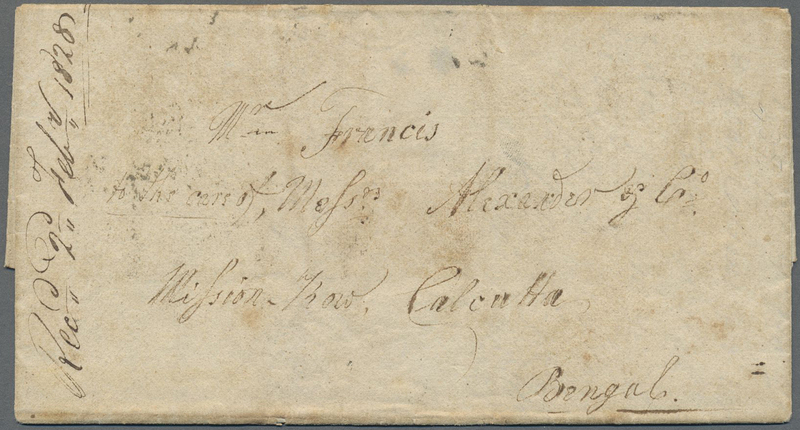 The text inside (one part of letter missing) refers to Philippines (= origin?) 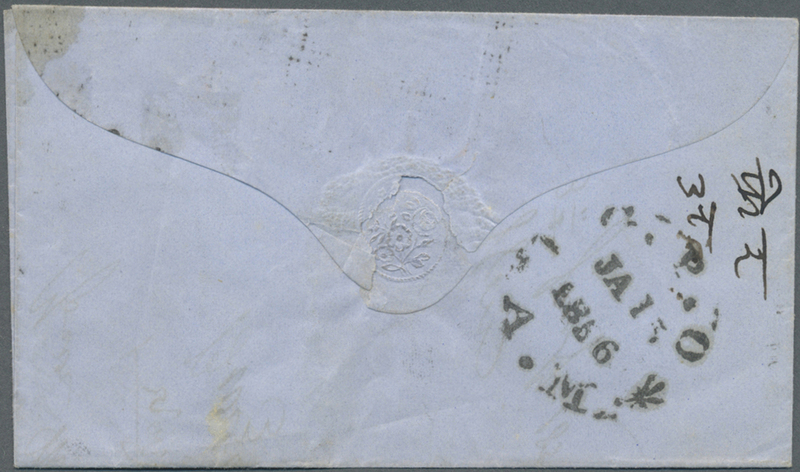 - an interesting cover. 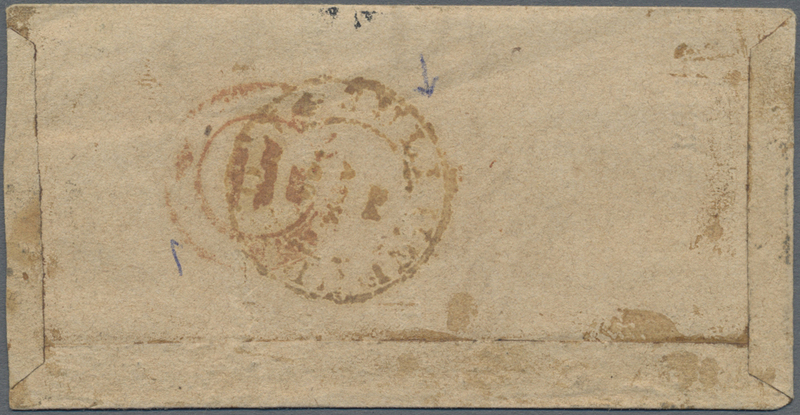 7850 Brief (cover) 1845 Stampless cover from R.R. 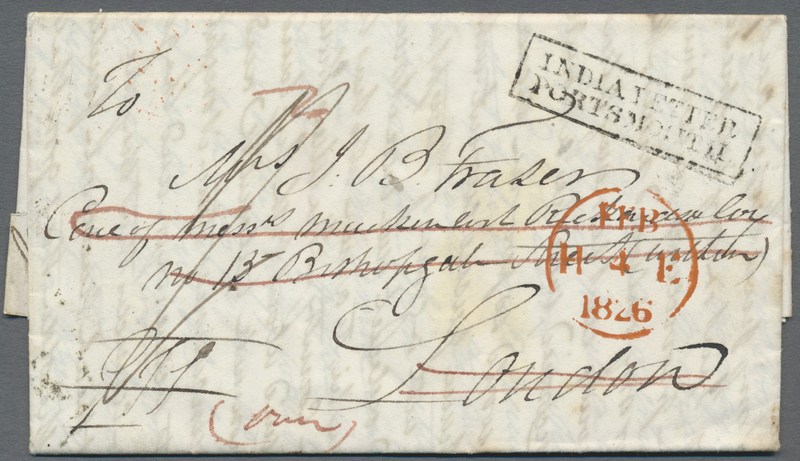 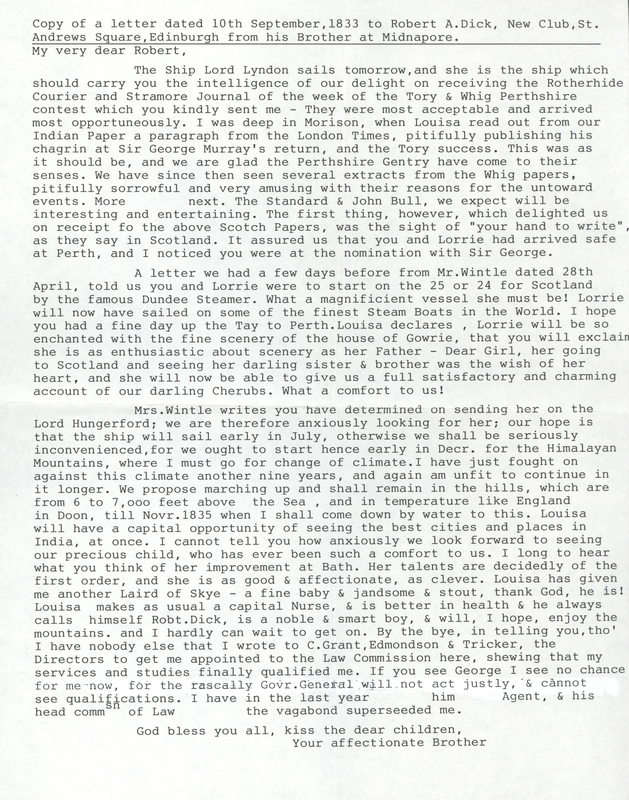 Adams at GWALIOR to 'Miss Adams' to Forres, Scotland via Marseilles and London, redirected to Ardersier, with rect. 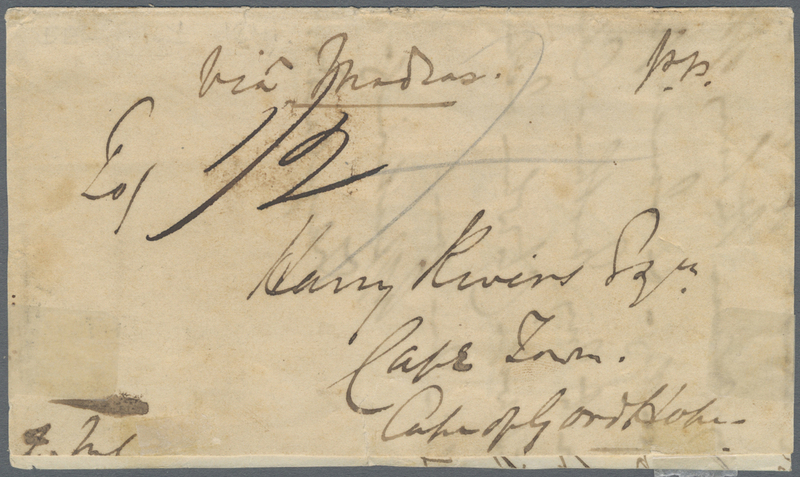 framed "GWALIOR/Paid." 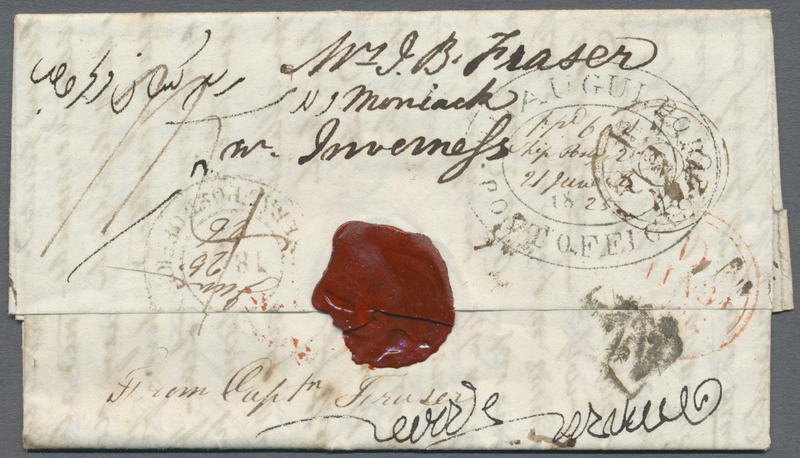 h/s in red (Giles 5) and inscribed '23 Dec. 1845/1 Tola/8 As' in m/s, and with London "UP/12 FE 12/1846" transit cds (UP denotes duty, not TPO), and boxed Forres and Ardersier '15 Feb 46' arrival datestamps. 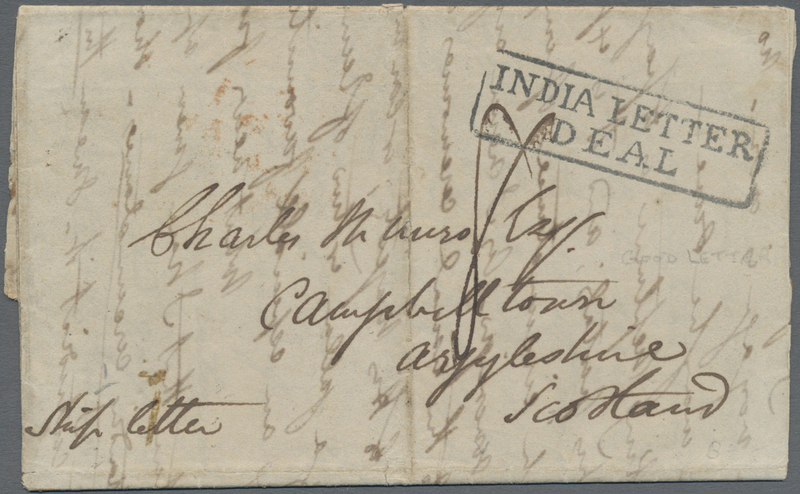 A fine, early and interesting cover from Gwalior. 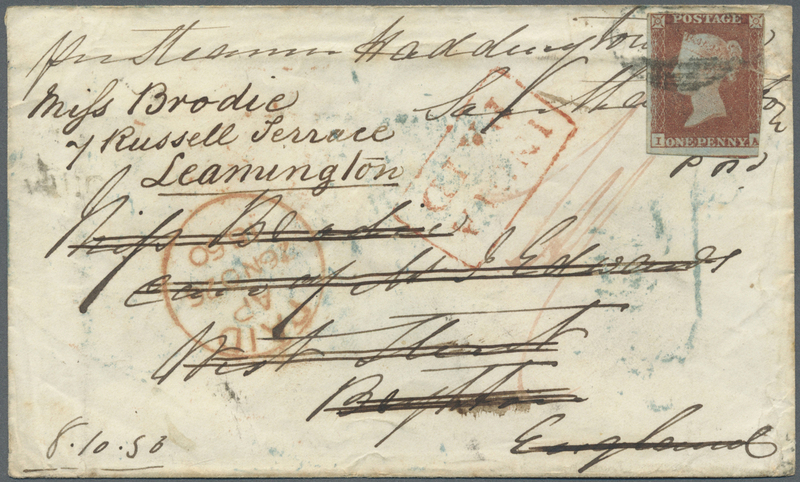 7852 Brief (cover) GB 3 1850 Cover from Calcutta to Brighton by steamer "Haddington", re-addressed on arrival to Leamington and franked by Great Britain 1d. 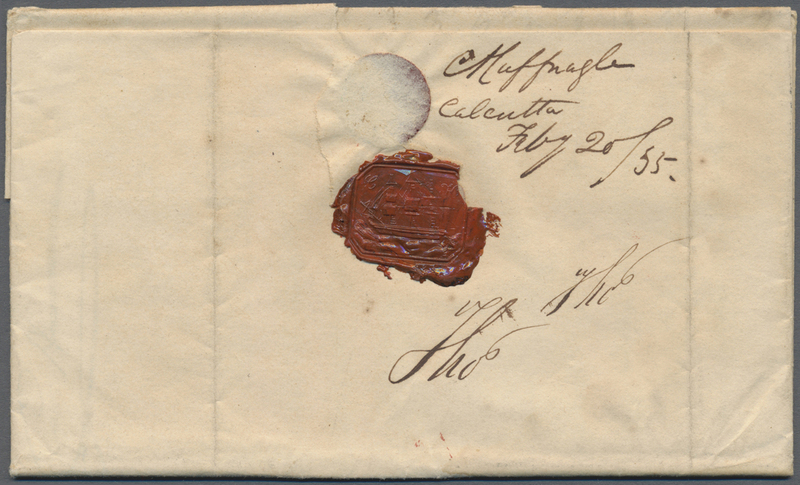 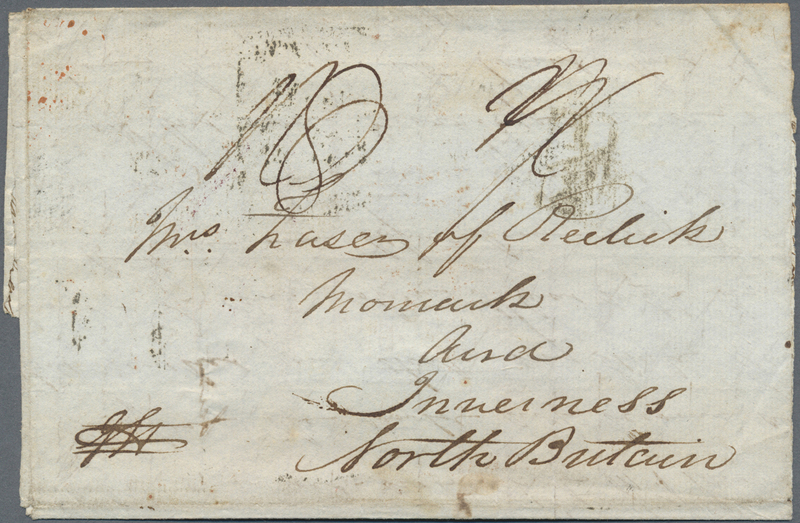 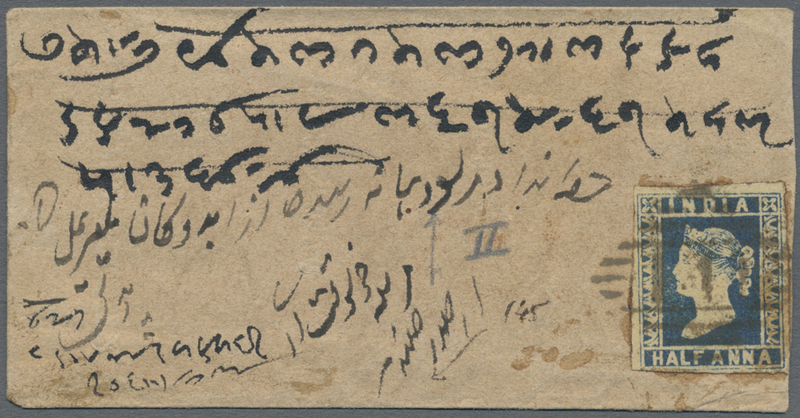 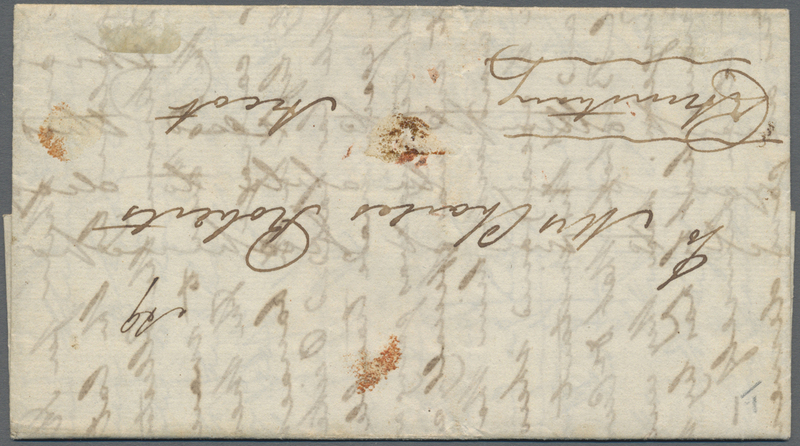 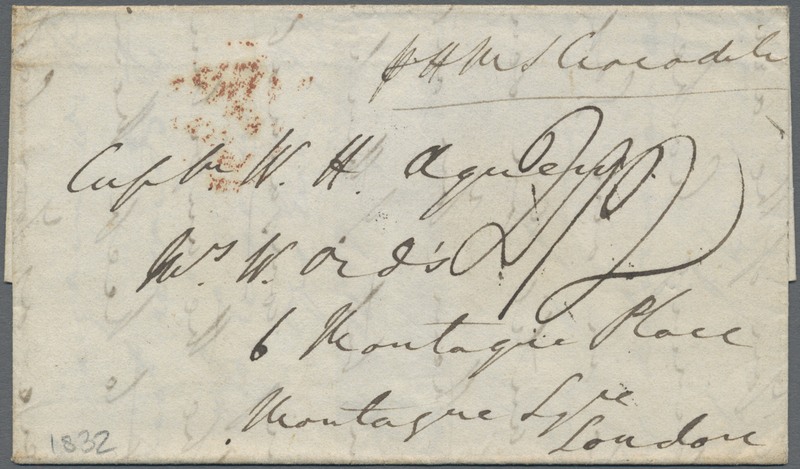 red-brown on blued paper (lettered I-A), with respective datestamps and postmarks, horiz. 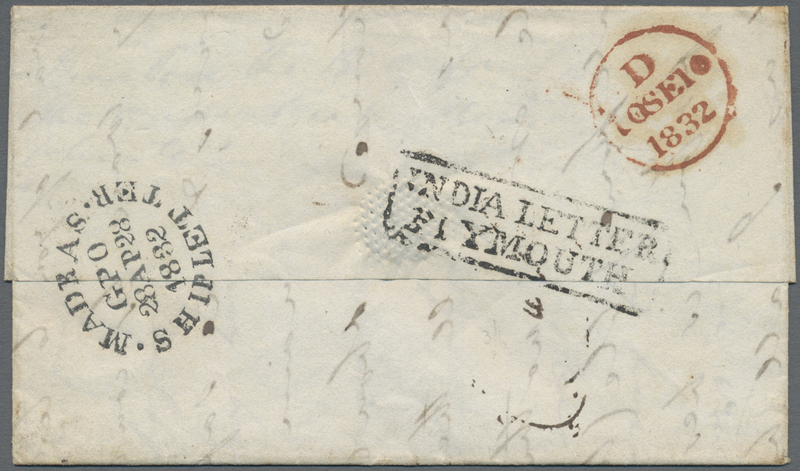 cover fold, through adhesive also, but still an attractive and early franked cover from India. 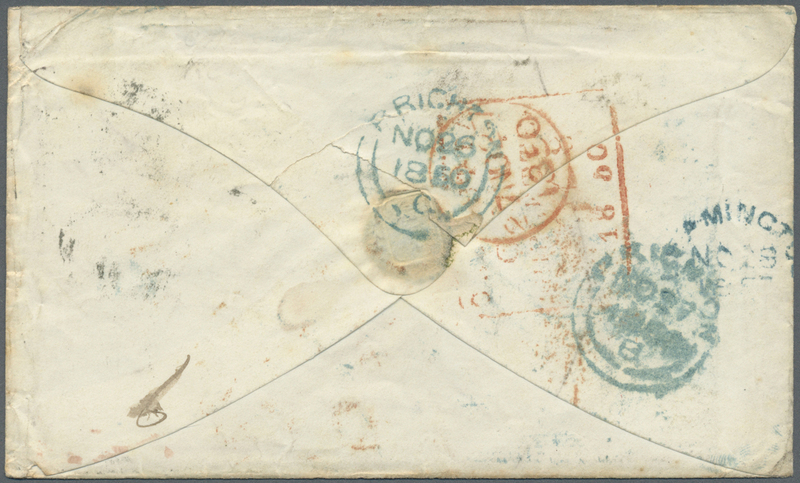 7855 Brief (cover) 4 (SG 4) 1855 District Post Puttoocotah: Folded cover franke by 1854 ½a. 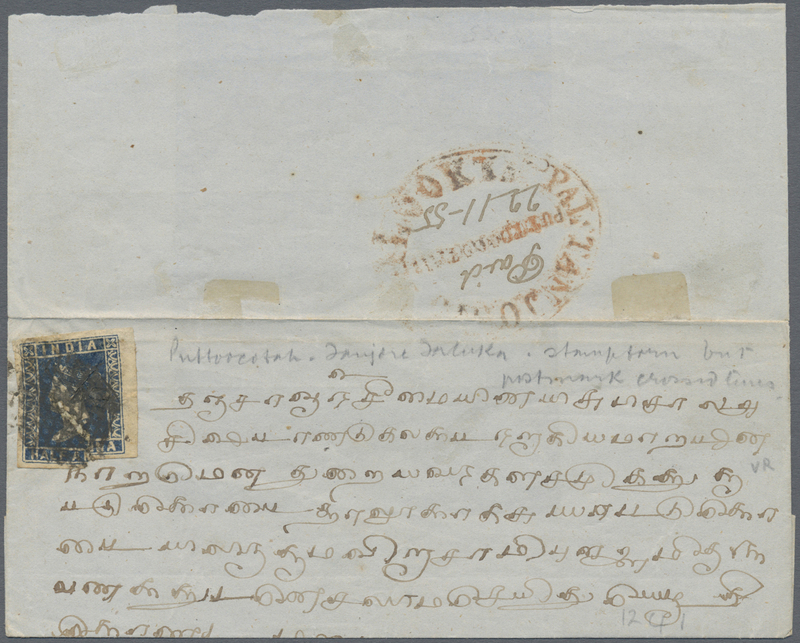 deep blue, Die I, wide margins but used damaged, tied by diamond of dots, large oval handstamp "TANJORE TALOOK TAPPAL/PUTTOOCOTAH" in red + 'Paid' and date '22-11-55' in m/s on the reverse, minor faults. 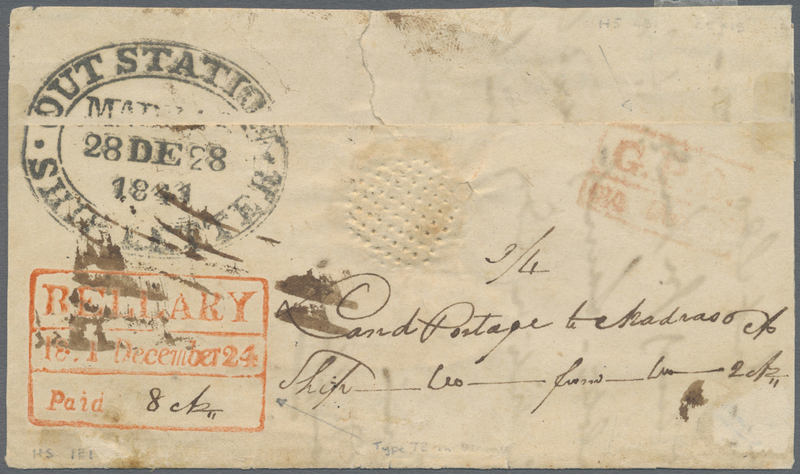 A RARE DISTRICT POST LETTER with a RARE POSTMARK. 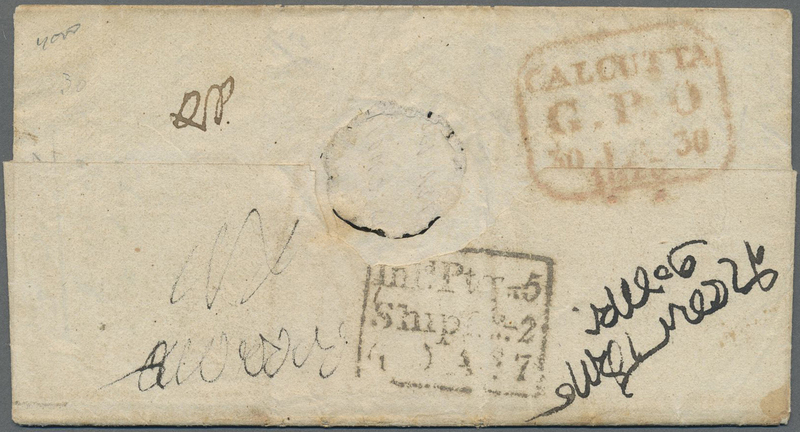 7857 gestempelt (marked) Briefstück (on piece) ex SG 2/31 1854 Group of two singles ½a. 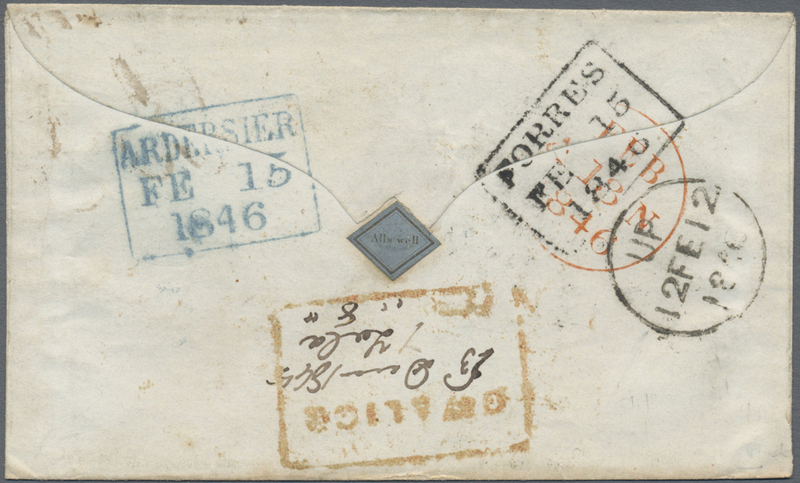 blue, three of 1a. 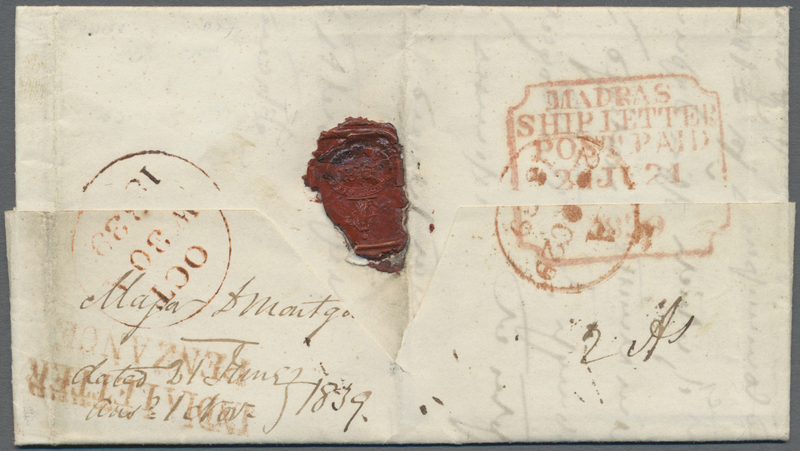 red (one on piece) and three 2a. 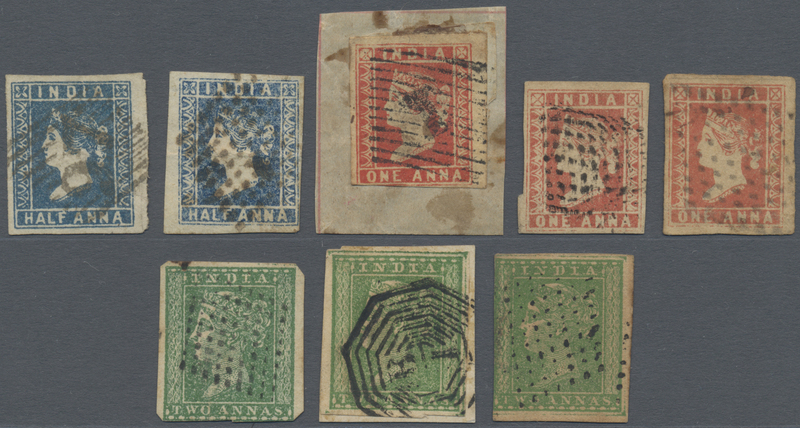 green (one on piece), all used with various cancellations, the 1a. 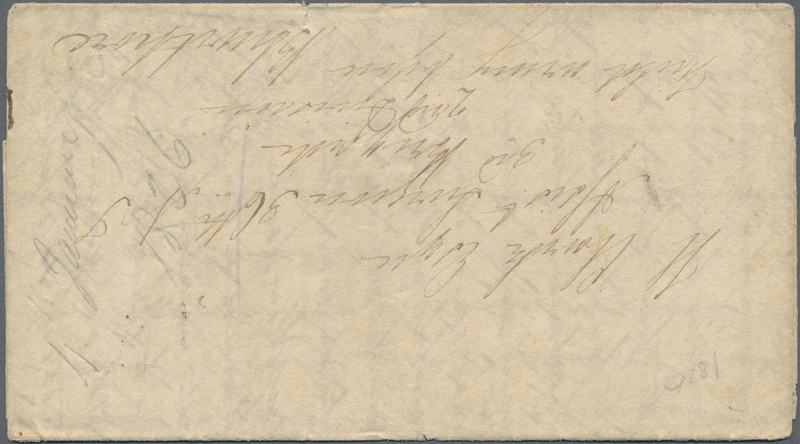 on piece and two of the 2a. 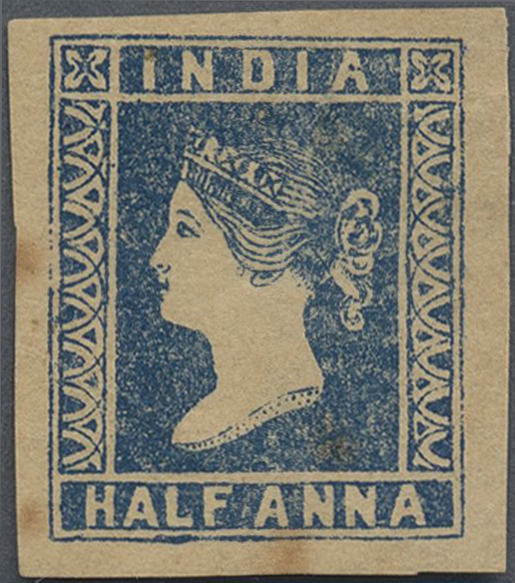 stamps slightly cut one side, complete to wide margins else, and the 2a. 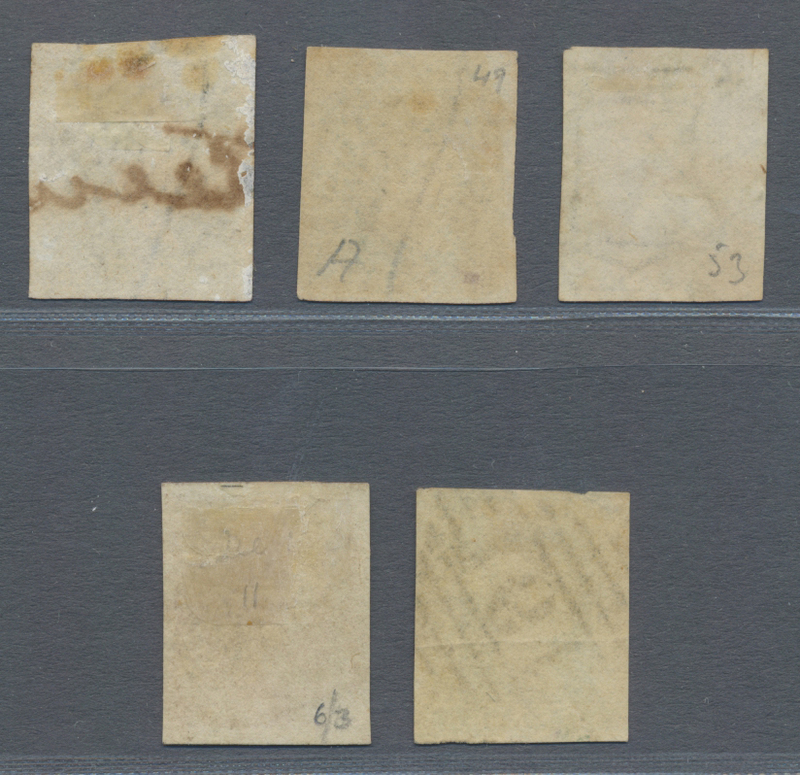 stamps with parts of outer framelines. 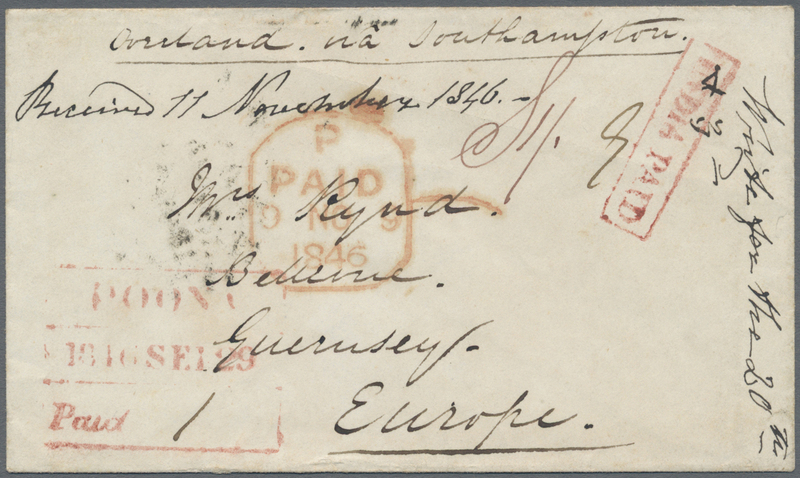 7858 Brief (cover) ex SG 2/8 1854-55 Three small covers each franked by lithographed ½a. 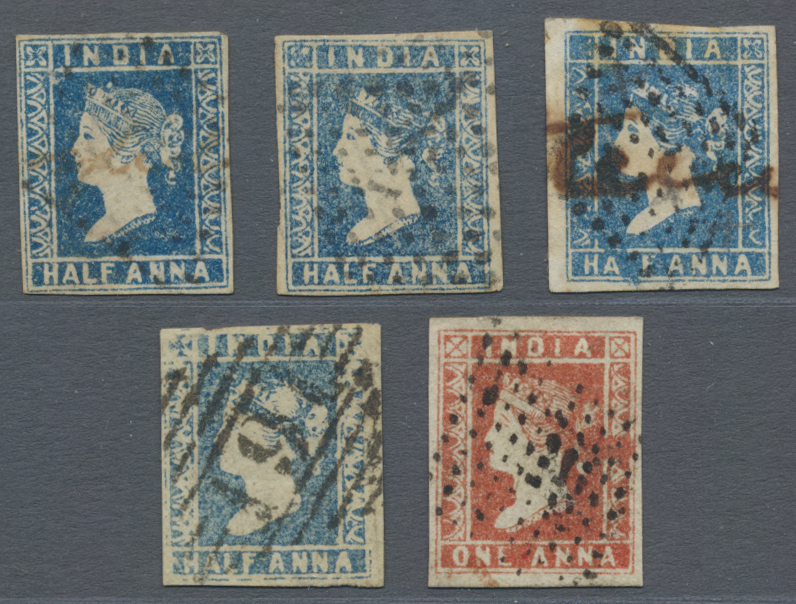 blue (various dies and shades, one with retouched chignon), with various postmarks as from Umritsur, Neemuch and others, good to fine.